Keep your hands free and your tables dry. Carry your mason jar or water bottle with ease. Three styles, three sizes available. Custom orders welcome..choose your colors or theme! Carry your bottle over-the-shoulder or cross-body. This is our most popular style. Large holds quart mason jar, most 24-36oz water bottles, most 24-32oz takeout drink cups, and crowlers. Medium holds pint (16oz) mason jars and most 16-20oz water bottles. Small holds small mason jars and small water bottles. =Wrap your hand around your container and turn it into a giant mug. 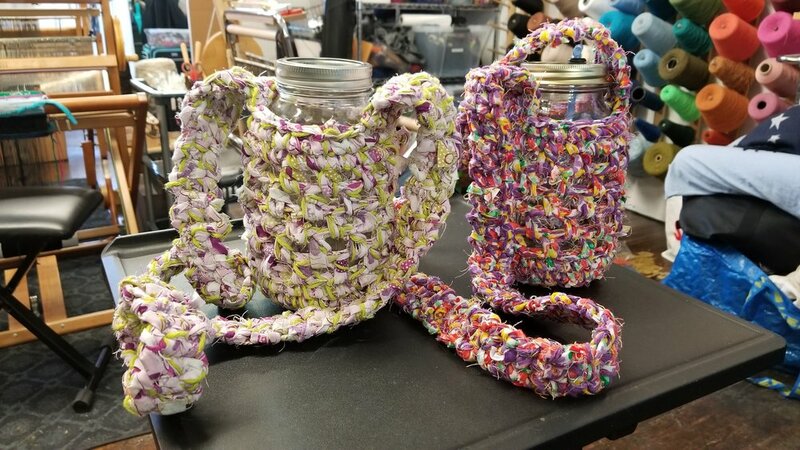 This is a traditional qozie that wraps your mason jar, water bottle, or can to keep your hands and tables dry. Small holds small mason jars a, small water bottles, and 12oz cans.